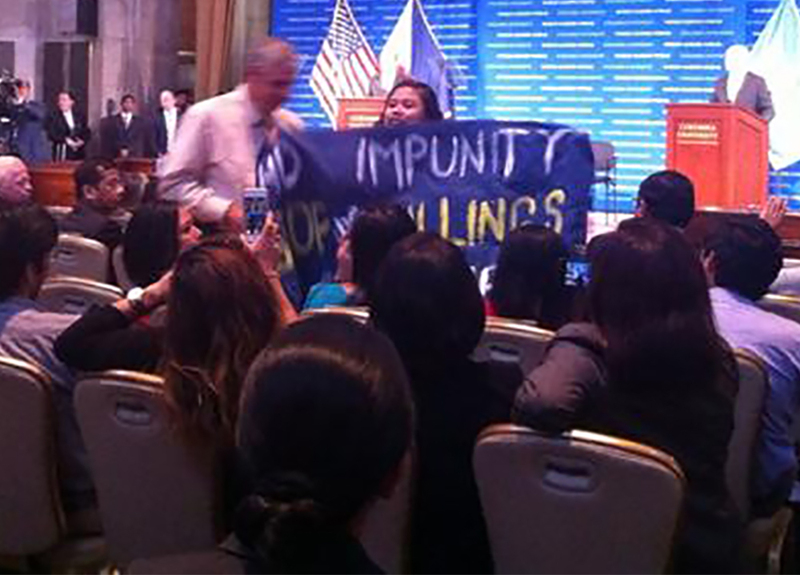 Members of Bagong Alyansang Makabayan based in the United States staged a protest at Columbia University disrupting President Aquino, who was delivering a speech regarding his supposed ‘achievements’ at the Columbia University’s World Leader’s Forum. Young Filipino-Americans with Anakbayan New Jersey, New York Committee for Human Rights in the Philippines (NYCHRP), and Gabriela New York challenged him from the audience during a forum held in Columbia’s Low Memorial Library with questions on the pork barrel scandal, Typhoon Haiyan, and human rights abuses treated with impunity. At the same time, a rally was conducted outside in the main courtyard of the university with BAYAN USA, a Filipino-American social justice alliance. Acceleration Program (DAP),” stated Jenab-i Pareja of NYCHRP. A banner reading “Oust Aquino, Pork Barrel King” was unfurled by the stage in front of the audience. Prior the disruption of Aquino’s protest, the President again took a swipe at his predecessor and now under hospital-arrest, Gloria Macapagal-Arroyo. Aquino talked about his difference from former President Gloria Macapagal-Arroyo whom he compared to the late dictator Ferdinand Marcos. “To some, democracy was a tool to be manipulated; power was a seat to be claimed, from which one could impose his or her will upon the people. This was most apparent in the nine-and-a-half-year administration of my predecessor. Instead of learning the lessons of history under the dictatorship, she seemed to have taken a course on how to abuse the system, straight from Mr. Marcos’ playbook,” Aquino said. A lady protester inside the hall engaged President Aquino to answer the issues of human rights violations under his administration. Joelle Lingat of Anakbayan New Jersey said, “I have been to Hacienda Luisita. I have seen first hand the continuing plight of the farmworkers, the families of the laborers of those who were massacred for wanting to earn more than 9 pesos a day. It’s unbelievable to me that this can happen in the piece of property owned by the President’s family.” New York City police then escorted out Lingat. The group believes that Aquino is dodging accountability over the massive extra judicial killings and other forms of human rights violations in the Cojuangco-Aquino clan’s vast sugar plantation estate. Hacienda Luisita, which has been ordered to be distributed to its farmers, is yet to be given to the land tillers and plantation workers. Several human rights violations have been reported and recorded by rights group Karapatan. Around 35 demonstrators continued to protest outside the hall until the President left the campus.